Santa Marta is South America's oldest European-founded town and Colombia's premier beach destination. Sprawling along the Caribbean coast and set at the foothills of the Sierra Nevada, it bustles with passionate street food vendors, weekend party people, and some of the best restaurants and bars Colombia has to offer. However it also makes a great starting point for exploring some of the lesser-known parts of the region, whether you're trekking through the jungle to explore the Lost City of the Tairona, lying by the calm azure waters of the Tayrona National Park, or hiking past the waterfalls of the Sierra Nevada Mountains. Full of spirit and colour, the best places to stay in Santa Marta have a real essence of the town's character. A fast-paced and fun-loving place, this is not everyone's cup-of-tea: packed with people, noisy and animated, by the weekend the already congested streets are brimming with Colombians who have come from all over the country to have a good time on the wide white beaches that teem with cocktail bars and live music. In the Parque de los Novios, one of its central plazas, you are surrounded with clusters of gourmet restaurants and trendy bars. Walking down to the coast of the southern suburb of El Rodadero, you see the livelier bars inhabited by the young and hip and, sprawling before you, wide beaches. Throughout the city are busy street food vendors selling ceviche, fresh fruit and lobsters, though the best food can be had on Avenida Bastidas - the ocean promenade - for a stay in Santa Marta isn't complete without sampling its street food. The less crowded beaches are not far away: you can go scuba diving in the coral reefs by Taganga, a place popular with foreign backpackers, or take a ferry and head to Playa Blanca Beach, with lovely little restaurants serving basic but wholesome meals. Scuba diving and snorkeling - check out the Caribbean sea life with a host of scuba and snorkeling tours available right from the Santa Marta beach. The sparkling waters in Taganga, a small fishing village nearby, are popular with backpackers and are famous for their coral reefs - there are several scuba diving companies there. Museo del Oro - a wonderful museum boasting a huge collection of indigenous and colonial pottery and gold artefacts. Parque Nacional Natural Tayrona - a short taxi ride out of town (it should take around 30 mins), this national park is an absolute must. Boasting some of the most beautiful beaches in the world, the park is also large enough to feel secluded. The Lost City - trek to visit some of the most spectacular ancient ruins anywhere in world. Built over 600 years before Machu Picchu, this site is not only breathtakingly beautiful but also fascinating. It also has far fewer visitors than Machu Picchu, largely thanks to its inaccessibility. Although there are ‘luxurious’ ways to get there, these generally involve sitting on donkeys for extended periods of time and so we would recommend getting the walking boots out (and the sun hat!). Santa Marta has a Miami-style feel to it: vibrant, colourful, lined with beaches and dense with people, it is popular with partygoers and backpackers alike. So whether you want to go hiking through the jungle, learn about the ancient pre-Colombian people or just sunbathe on sand beaches with a refreshing cocktail in hand, Santa Marta is for you, and our collection of the best places to stay in Santa Marta will cater to your every need. Hotel Boutique Don Pepe offers modern design, large rooms and all the creature comforts you can imagine including a fabulous spa. Plus you're just a short walk from the beach. Casa Verde enjoys a superb location right in Santa Marta's historic centre, yet also not far from the beach. The nine rooms are arranged around a beautiful central courtyard adorned with hammocks and featuring a plunge pool for cooling off. 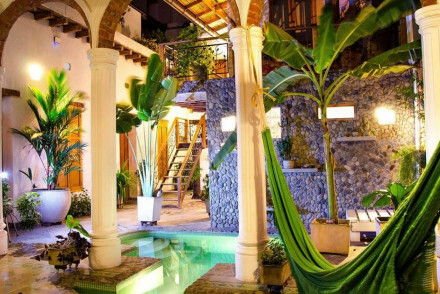 Set in a quiet location in the historic centre, Casa Carolina is both stylish and comfortable with a full spa to relax in after a day in the sun. 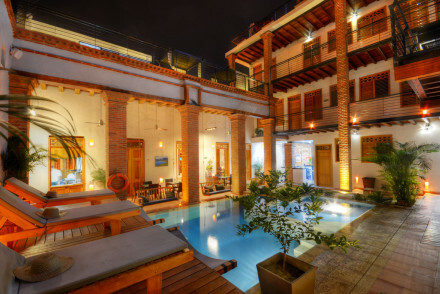 Rooms are spacious with smart modern bathrooms, plus there's a charming courtyard with a pool and restaurant. Our partner Booking.com has a wide range of villas and apartments in the area. For the driest period aim to visit between December and April. You can expect temperatures in the early thirties year-round so don’t forget your sun cream! Fly to Simon Bolivar International Airport in Santa Marta which regularly takes flights from Bogota. If you're getting a taxi from the airport, fix the price in advance as they don't run on meters and some try to swindle unsuspecting tourists. If you want to rent a car we recommend you contact our online partner Rentalcars. Expand your search to include the best places to stay in Buritaca. Or contact a Guru for advice. A boutique hotel boasting a quiet location in the historic centre and just a short walk from the beach. Characterful rooms feature exposed stone, beamed ceilings and brightly dressed beds. A fabulous spa will fulfil all pampering needs. The perfect jump off point to explore this wonderful region. Local exploring - Boasting a fabulous location next to San Francisco Monastery in Santa Marta's historic center. Diving - Take a scuba diving course at nearby Taganga. 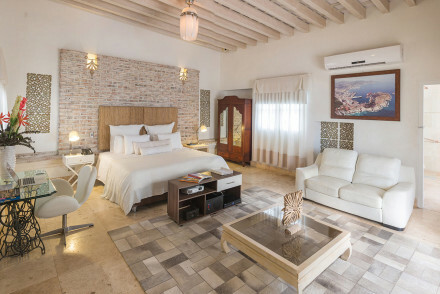 A luxury boutique hotel in the heart of Santa Marta. Well proportioned rooms are elegantly styled with exposed brick work, minimalist furniture and high ceilings. Unwind by the courtyard pool or over a massage in the fabulous spa. Just a short walk from the beach. Very chic. Local exploring - A well positioned hotel with easy access to both the beach and the commercial centre. Sights nearby - Visit the beautiful Cathderal of Santa Marta thought to be one the oldest cathedrals in South America. Casa Verde hotel is located in the heart of Santa Marta a short walk from the beach. It features spacious white rooms with snaps of bright colour in the tiles and fabrics. A shady central courtyard creates a laid back vibe. Be it cooling off in the pool, nightlife or beach, this is a great choice.